Haryana farmer Ranbir Singh was sentenced to two years in jail after he was unable to pay farm loans. 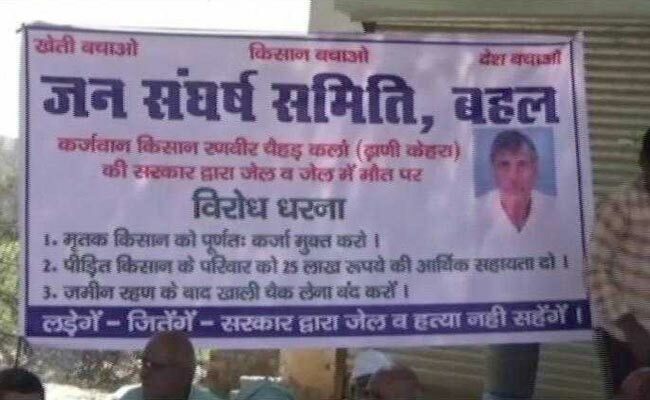 Ranbir Singh's family and other farmers protested in Bhiwani after his death. Ten days after he was sent to a jail in Haryana for failing to repay a bank loan, a 65-year-old farmer died on Tuesday. Ranbir Singh died on the same day thousands of farmers protested near Delhi demanding loan waiver, pension and subsidised electricity and fuel. Doctors said the farmer may have died of heart attack and are waiting for the post-mortem report. The farmer complained of chest pain on Monday night and was taken to Bhiwani's Civil Hospital where doctors declared him dead on arrival. Ranbir Singh's family, however, alleged foul play in his death. The family and other farmers sat in protest with his body outside a senior district official's office in Bhiwani on Tuesday. They refused to cremate his body until their demands from the government, financial compensation and waiver on the pending loan. The family also demanded a temporary job for one of the members. Ranbir Singh was sentenced to two years in jail by a local court in Haryana's Bhiwani, 112 km from Delhi, after he was not able pay a farm loan worth Rs. 9.65 lakh and because his cheque given to the bank had bounced. A sessions court in Bhiwani confirmed farmer Ranbir Singh's conviction on September 21. Ranbir Singh had taken farm loans twice - 23 years ago and later in 2006. By then, he owed over Rs. 9 lakh. The Haryana State Cooperative Agriculture and Rural Development Bank filed a case against him when the blank cheque he had given bounced due to insufficient funds. He was convicted by a trial court in 2016. Ranbir Singh approached a higher court which confirmed his conviction on September 21. "The loan interest kept increasing. His land was seized. They even took a blank cheque from him. This is against the law and banking policy. You can't take double surety from a person. They take blank cheques from farmers and fill in the any amount," Ranbir Singh's brother said. The protesting family members and farmers returned home on Tuesday after authorities gave an assurance that their demands will be met.